Dave Morgan describes some of the treats in store for children and adults in our local Open Gardens. For children, gardens can be a wonderland of exciting new things to discover and new experiences to be enjoyed – and the same can apply to adults, especially when visiting other people’s gardens. And that is one of the joys of the National Gardens Scheme (the NGS), which encourages gardeners of all abilities and with gardens of all shapes and sizes to open up for visitors to enjoy, whilst at the same time raising money for worthwhile nursing-related and other charities. But when a garden opens for the NGS and offers something interesting for both children and adults, then it really is something special – and such a garden is opening for the first time for the scheme this year, in Webheath near Redditch. 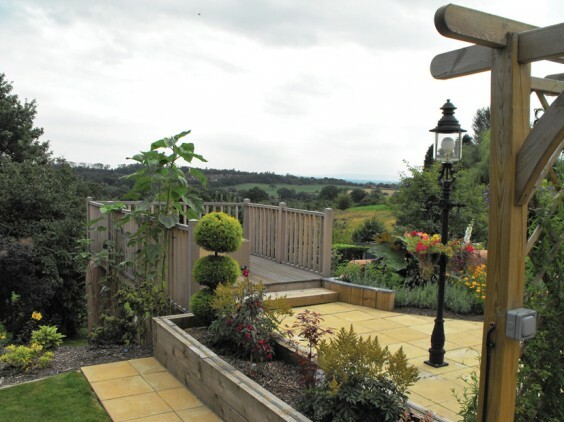 The garden at The Cottage, 3 Crumpfields Lane (pictured above), is a newly-established landscaped garden on four levels and created into “rooms”. There are two water features (one in a cave) and stunning views over the Vale of Evesham and the Cotswolds from an elevated sitting area. Owner Victor Johnson has been busy planting over 2,000 new plants to supplement his existing planting scheme, which includes a wild flower area – and although the garden is quite steep in places, many of the paths are wheelchair accessible. So plenty for adults – but what about children? Well, Victor is creating “Wonderland” at the bottom of his garden – no, not fairies, but Alice and many of Lewis Carroll’s other creations will be there in statue form for younger visitors to see and enjoy (and older ones too, I’m sure!) The Cottage garden will be open on Sunday June 15 from 10am until 5pm. But many garden owners can claim that their own gardens are a kind of wonderland, especially when a visitor says so – as one did after visiting Pump Cottage in Weatheroak (which will be open over the weekend of June 20 to 22). That particular visitor called Pump Cottage garden “a secret wonderland with surprises at every turn” – as indeed it is. This is an enchanting, romantic one-acre “plantaholics” garden with colourful borders, roses, rockery, fernery, water features including a lake and various artefacts and other items of interest. There is also a Victorian-styled greenhouse, plants for sale and some of the best cakes in the county – for those who enjoy refreshments when visiting gardens! And if you want more wonderland, try visiting Alvechurch on June 21 or 22 when there will be 10 gardens open, ranging from a cottage garden with lots of pots to a professionally landscaped terrace garden, and from fruit and vegetable gardens to gardens with rockeries and sculptures. For a combined entrance fee of only £5 this represents fantastic value at 50p a garden, and gives visitors the chance to see behind many of the old houses in the village. Which all raises the question: do you have a bit of a “wonderland” behind your home? The NGS is always on the lookout for new gardens to open, and now is the time to contact the them if you would like your garden considered for opening in 2015. As County Organiser I am always interested in hearing from people who would like to consider this – my contact details are in the yellow Worcestershire leaflet which is available from most libraries, tourist information centres and good garden centres, as are details of all the gardens open in Worcestershire. You don’t need a huge garden or a degree in horticulture to create a wonderland in your own little bit of Worcestershire – just a mixture of interest and enthusiasm with a bit of hard work thrown in for good measure!